Kitchen countertops are a focal point for the overall aesthetics of the kitchen and you have many options to choose from in materials and colors. Each materials has advantages and disadvantages and as it can be a major cost in a kitchen remodel one should give the choice a great deal of consideration. As well as being decorative it must provide the necessary characteristics to suit the type of cooking and food preparation that you do. Following is a list of 15 kitchen countertop materials. A laminate countertop (Figure 1) is made of a plastic coated synthetic material bonded to a sheet of particle board for strength. The laminates come in many colors, patterns and textures. Manufactured laminate countertops usually have an integral back splash and a slightly rolled front edge. Seams, if necessary to go around corners are generally visible. If one is creating their own laminated countertop, edges will show and creating a good seam requires a great deal of skill and practice. Advantages: Laminates come in hundreds of patterns and textures very easy to maintain; inexpensive; very easy to cut our for sinks and faucets. Disadvantages: Scratches and chips are impossible to repair; can discolor if hot pots and pans are placed on the surface, seams show. In general ceramic and porcelain tiles are durable and easy to clean and make a good countertop material (Figure 2). The ceramic or porcelain tile itself is relatively inexpensive, but it requires a base of plywood in order to provide strength Installation can be complex on edges. Tiles must be grouted, and the grout must be sealed. Because tile colors, shapes and textures change on a regular basis, additional tiles should be purchased to ensure replacements. Advantages: Stands up to hot pots and pans; relatively easy to clean; hundreds of colors, patterns and textures; individual tiles can be replaced if damaged. 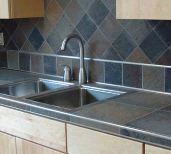 Disadvantages: Uneven countertop surface easily chips and cracks grout lines can stain and look dirty; relatively easy to cut out for sinks and faucets. Granite countertops, (Figure 3), are extremely elegant and add a sense of "class" to any kitchen. Because granite is a natural stone, all countertops must be ordered at the same time in order to ensure matching grains and colors. If a countertop is damaged in the future, an exact replacement is not possible. Advantages: Holds up to heat; comes in beautiful colors; looks permanent and substantial. Disadvantages: Very expensive requires lots of maintenance, including periodic sealing; absorbs stains; can crack and chip; very heavy and may require that base cabinets be reinforced, difficult to cut and hence sink and faucet cut-outs must be determined prior to order; seams have a tendency to show. Engineered stone countertops (Figure 4) offer a sophisticated elegance and timeless beauty, and is now being offered by numerous manufacturers. The natural quartz used in the manufacture makes it naturally scratch-resistant. Only three other natural minerals — diamond, sapphire and topaz — are harder than quartz. Quartz is a seven on Mohs Hardness Scale (diamond is a 10). So, while a careless slip of the knife will scratch most other countertops such as laminates and solid surfaces, it won’t leave a mark on engineered stone. Engineered stone delivers distinctive depth, brilliant clarity, glimmering radiance and a cool, solid feel unique to natural stone. It is available in a larger range of colors than granite. It's easy to maintain, without the sealing required when using natural stone products. Advantages: Resistant to stain and acid; easy care repairable, colors are repeatable; seams do not show. Disadvantages: Expensive can be damaged with excessive force or pressure.